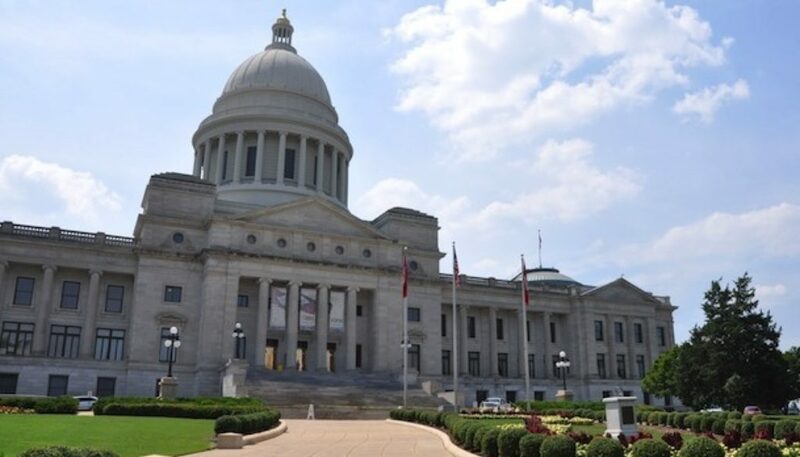 The Arkansas Senate on Thursday handily approved referring to voters in the 2020 general election a proposed constitutional amendment that would permanently extend the state’s half-percent sales tax for highways. The tax originally was approved by voters in 2012 for just 10 years. Without any debate, the Senate voted 25-7 to approve House Joint Resolution 1018 by Rep. Jeff Wardlaw, R-Hermitage, after Sen. Lance Eads, R-Springdale, briefly explained the proposal to senators. The proposal is projected by state officials to eventually raise about $205 million a year more for the state Department of Transportation for highways and $44 million a year more each for cities and counties. Its approval completes legislative action on Gov. Asa Hutchinson’s two-part plan to eventually raise about $300 million more a year for the Department of Transportation. The roll call showed that 18 Republicans and seven Democrats approved HJR1018. Dissenting votes came from seven Republicans. Two Republicans and a Democrat didn’t vote. The House voted 67-30 to approve HJR1018 on Monday. No action by the governor is required. Then, Sen. Mark Johnson, R-Little Rock, surprised Senate President Pro Tempore Jim Hendren, R-Sulphur Springs, and others by temporarily putting a hold on sending the measure back to the House. Johnson used a Senate rule on providing notice to reconsider the vote. Eventually, Johnson released his hold after a private conversation with Hendren outside the chamber. “I should have talked to the president pro tempore about what I was up to and I apologized to Jim,” Johnson said in an interview afterward. Johnson said he hopes to talk to Hutchinson about his Senate Bill 498 that would, among other things, increase the state’s tax rates on casino gambling receipts as set in Amendment 100 to the Arkansas Constitution. The amendment, approved in November by voters, authorizes up to four casinos in the state. “With the Senate’s passage of HJR1018 this afternoon and the legislature’s passage of the $95 million highway-funding bill earlier this week, the 92nd General Assembly has approved the largest and most comprehensive long-term highway funding plan in state history,” Hutchinson said in a written statement. “Because of the passage of HJR1018, Arkansas voters will have the final word on funding for the construction and repair of the roads they drive each and every day. “I’m grateful for the leadership of President Pro Tempore Jim Hendren, Speaker Matthew Shepherd, and each of the sponsors who carried this legislation through the House and Senate. I look forward to continuing to make history alongside these members as I sign this highway-funding package next week,” Hutchinson said. The governor plans to hold a signing ceremony at 11 a.m. Tuesday, said his spokesman, J.R. Davis. The Senate on Tuesday sent Hutchinson legislation that would raise $95 million more a year for state highways. It’s the other part of the governor’s two-part long-term highway funding plan. After concurring with a House-approved amendment removing House Republican Whip Brandt Smith of Jonesboro as a co-sponsor, the Senate voted 25-8 on Tuesday to send the Republican governor Senate Bill 336 by Sen. Terry Rice, R-Waldron. The action came a day after the House voted 71-26 to approve the legislation. The bill would levy a wholesale sales tax on gasoline and diesel fuel; increase registration fees on electric and hybrid vehicles; and transfer at least $35 million a year in casino revenue, restricted reserve funds and other funds designated by the governor to the Department of Transportation. The new wholesale sales tax would increase the tax on gasoline by 3 cents a gallon, to 24.5 cents a gallon, and the tax on diesel by 6 cents a gallon, to 28.5 cents a gallon. The tax increases would become effective Oct. 1. The bill would allow increases of up to one-tenth of a cent a year, meaning the maximum increase would be 1 percent over a 10-year period. The wholesale tax would raise about $58 million more a year for highways and about $13 million a year more each for cities and counties. SB336 also would increase registration fees for electric vehicles by $200 a year and those for hybrid vehicles by $100 a year to raise about $1.9 million a year. The fee increases would become effective Oct. 1. Under the bill, if the casino tax receipts fall below $35 million, the bill would draw from a restricted reserve fund or other funds designated by the governor to reach that threshold for highways each year. Casino revenue is expected to reach $35 million in fiscal 2025, according to state officials. Under Senate Rule 13, Johnson announced to the Senate that he was giving notice of reconsideration of the initial vote on HJR1018, after he voted for it. That triggered several questions from senators, who appeared to be confused by Johnson’s parliamentary move. Griffin replied, “You cannot on a notice of reconsideration. This is to be distinguished from a motion for reconsideration under Rule 13. He also said, “The notice to reconsider … is basically the Senate’s body’s version of a hold. “If he does nothing, then Thursday of next week this resolution will on its own leave this body and go to the House as if nothing has happened,” Griffin said. After Hendren and Johnson met privately outside the chambers, Johnson said, “I believe I owe my colleagues an explanation for my action. “In all fairness because some of you didn’t know the rule, I frankly know the rule because I watched it being done for years and years and it is de facto a hold to take a look something,” he said. “Now, I am for this bill. I voted for it. Matter of fact, I pledged to vote for it back in May after the primary when I received a call from the governor and told him that we need to fix roads. “However, I have another bill that has a direct relationship that some of you may have looked at it … and that’s the bill [Senate Bill] 498 which amends Amendment 100,” Johnson told senators. Among other things, “it would undo what I consider a great travesty in that Amendment 100 sets a permanent tax rate for casinos in the Constitution which ultimately is more than a 50 percent tax cut for the casinos as compared to what the revenues of the state are on electric games of skill,” he said. The state collected $67 million in fiscal 2018 from electronic games of skill at Oaklawn Racing and Gaming and Southland Gaming and Racing, according to Richard Wilson, assistant director of research for the Bureau of Legislative Research. The current tax rate is 18 percent. Under its latest projection, the state Department of Finance and Administration forecasts the state will take in $31.2 million in casino revenue in fiscal 2020, which starts July 1, and that the figure will grow to $52 million in fiscal 2021, and gradually increase to $74.8 million by fiscal 2028. Johnson’s SB498 would increase the casino tax rate to 20 percent on the first $150 million of receipts and to 25 percent on the amount above that. It also would increase the amount of receipts dedicated to general revenue from 55 percent to 65 percent. It would decrease the amount dedicated to the Arkansas Racing Commission’s purses and awards from 17.5 percent to 7.5 percent, according to Johnson. The measure also would require referendums in Pope and Jefferson counties (which would get casinos under Amendment 100) to approve a casino in those counties and allow Johnson and Conway counties to hold a referendum for a casino if the referendum is rejected in Pope County, Johnson said. His bill also would limit the casino licenses at Oaklawn and Southland to 10 years with subsequent renewal by the Arkansas Racing Commission, he said. “Now, our policy, the governor’s policy which I support, is that those casino revenues [above $31.2 million] will be dedicated toward highways. I also would like us to put less burden on the taxpayers of the state of a slight modification of Amendment 100. Instead of giving them that tax break at a time when we are going around asking people to pay more at the pump, we would actually raise the revenue to help us build our roads quicker. It would still not bring us back to where we are under the current revenues from electronic games of skill,” Johnson said. “Now that all of you have heard the explanation, I appreciate the opportunity to explain it and in doing so I will hereby remove my notice for reconsideration at this time and move that the bill be transmitted to the House,” he said. HJR1018 was transmitted to the House.